Is Ron Howard's Rush Taking Artistic Liberties With Racing History? 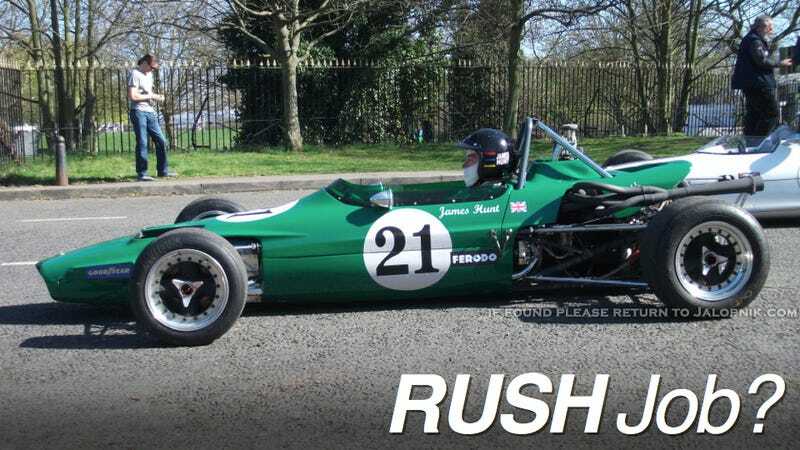 For his James Hunt/Niki Lauda biopic, Rush, director Ron Howard appears to be recreating a 1970 F3 race that helped shape the legend of Hunt, the mercurial 1970s Formula One champ and shag-o-lator. Of course, Hunt's arch-rival Niki Lauda was there too. Or was he? It was the 1970 Daily Express Trophy Final at the UK's Crystal Palace. Spectators and TV viewers (at least those who stayed with it until the very end) caught one of the most heated battles for second place ever fought on a racetrack. The only problem in using the race as a plot point for Rush is that the on-track fireworks weren't between Hunt and Lauda. They were between Hunt and driver David Morgan. In these on-location pics from a recent shoot at the former Crystal Palace circuit in London, you can easily spot Niki Lauda's F3 car (Number 35) on the grid by its red-and-gold livery (and his name printed on the side). But Lauda's McNamara Mk 3B wasn't at Crystal Palace that day in 1970. Indeed, it's Howard's right as a director to insert Lauda into the action to dramatize the fledgling rivalry between Hunt "the Shunt" and Lauda during those formative days in both drivers' careers. Presaging Hunt's brilliant future of driving, snorting and British Airways stewardess-defiling, the 1970 Crystal Palace race was often remembered for one of Hunt's infamous blow-ups — a post-race shoving match in which he knocked driver David Morgan to the ground. Hunt was angry about a crash he felt Morgan caused on the final lap that erased both drivers' podium hopes. It was a really fun afternoon, and fantastic to be able to get so close to the action, it was worth going temporarily deaf to hear the sound of those engines up close! I always remember the 70's as being full of endless sunny days, so this whole experience was a real trip back in time. The whole afternoon seemed to have a nostalgic kodachrome kind of feel to it, I even had a 99 flake* [a British candy bar of the '70s aimed at females —ed] for total authenticity! Will Howard extend the Hunt/Lauda rivalry into the realm of dramatic fantasy by making Lauda the subject of Hunt's shove? That remains to be seen. Lauda did race in European F3 that year, and the two did do battle — Hunt edged out Lauda for fourth place in the Critérium du Nivernais at Magny-Cours, round five of the 1970 French F3 Championship, but history doesn't recall the two resorting to fisticuffs. Note also that Hunt's Lotus 59 appears in green livery for the shoot, not its period-correct red. That's likely for better visual counterpoint with Lauda's red-and-white McNamara. Then again, check out the shot of current vintage racer Chris Holland on the grid in his 1967 Brabham BT21 F3. Holland certainly wasn't at Crystal Palace in 1970. How do you think racing nerds will take to Howard exercising his creative license this way? If the racing scenes are engrossing and the shots of Olivia Wilde are long and lingering, they'll probably be fine with it — although the most detail-obsessed may want to sit out the movie altogether. We'll know more when the film debuts in 2013. In the meantime, watch the original Crystal Palace race on YouTube, and enjoy the pointed play-by-play from a young Murray Walker. If you want to race like Hunt, you can [sorry, not quite yet, but you'll soon be able to drive all of his McLaren F1 cars — ed.] drive his post-championship 1977 McLaren M26 racecar on Simraceway (you'll soon be able to drive the 1976 M23 championship-winning car), although they haven't finished developing the Bedding Every Attractive Female In Range of a Race Course plug-in yet.